Crocheted clothing is the latest fashion trend. Crocheted vests are a way to continue this trend into the summer and fall months. However, most crochet patterns only accommodate a woman up to an extra large. If you are a curvaceous enough to require clothing larger than extra large, this article will teach you how to adjust a crochet pattern to make a vest that will fit you beautifully. Get an accurate gauge for your plus-sized vest. If 8 double crochets are supposed to equal 3 inches, for example, make sure they do. If you are a tight crocheter, you may need to go up a hook size to achieve this gauge. If you crochet too loosely, try to go down one crochet size until you achieve the appropriate gauge. As a rule, size increases are in certain increments. The pattern may ask you to chain 131 to achieve a small pattern, chain 134 for a medium pattern and 137 for a large pattern. As you can see, this pattern is asking for a size increase in increments of 3. An extra large would be 140 chains. So if you are a size 2X, you will need to go up two sizes from Large, or 6 chains. Once you find the sizing pattern, finding the increments in size should be simple math. Where are you bigger at? If you are a woman with a large bust, but an average torso length, you will only need to increase the size of your crochet vest across the width, not adding length unless you want to. 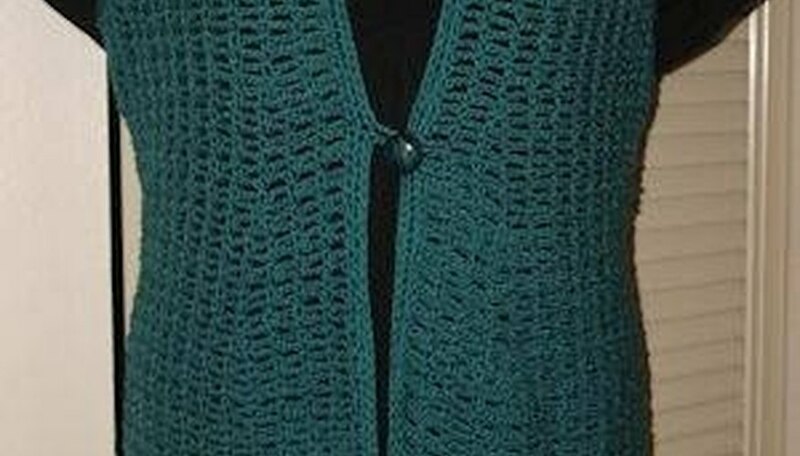 If you have a long torso, simply crochet additional rows onto your vest until you reach the desired length. Let's talk armholes. A vest consist of three parts--the back and two front panels. In the end, you stitch them all together. This is actually an advantage to the big and beautiful. Simply use fewer stitches on the sides to create armholes that can accommodate your arms comfortably. Buy two more skeins of yarn than you estimate. Don't over estimate your size. This could result in a frumpy looking crocheted vest. Crochet evenly around the edges. Just because your vest is plus sized, it does not have to be sloppy.